Google engineer proves any iPhone app with permission to access the camera is capable of spying: "Once granted, Krause advises it is possible for an app to photograph and record from the cameras any time the app is in the foreground, without informing the user the images and video are being captured with flashes or other indictors. " Troubling but not nearly as troubling as the gaping security holes on Android. Wi-Fi security has been breached, say researchers - The Verge: "At about 7AM ET this morning, researchers revealed details of a new exploit called KRACK that takes advantage of vulnerabilities in Wi-Fi security to let attackers eavesdrop on traffic between computers and wireless access points." Kind of a major fail. 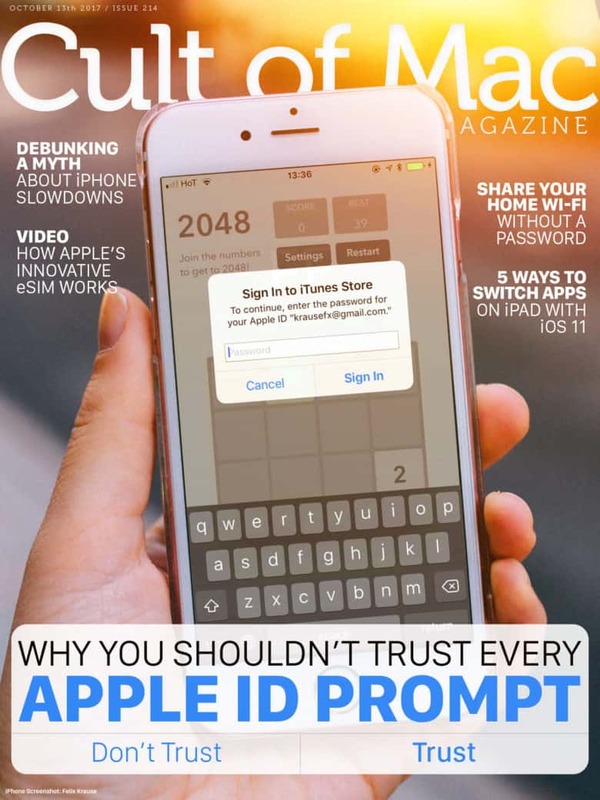 Cult of Mac Magazine: Why you shouldn’t trust every Apple ID prompt, and more | Cult of Mac: "It’s not uncommon to see a random popup that asks you to “Sign In to iTunes Store” on iOS. They sometimes appear unexpectedly, but they’re usually genuine. There is a chance that the app’s developer is phishing for your Apple ID password. We’ll show you an easy trick to distinguish legit popups from phishing attempts." Israeli spies 'watched Russian agents breach Kaspersky software' - BBC News: "Israeli spies looked on as Russian hackers breached Kaspersky cyber-security software two years ago, US media report. The Russians were allegedly attempting to gather data on US intelligence programs, according to the New York Times and Washington Post." Well, they can still sell to the Eastern Bloc and Brazil et al.